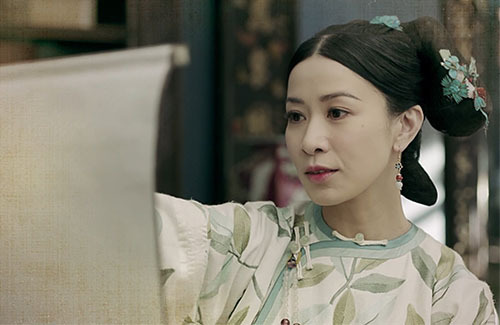 Chinese palace drama Story of Yanxi Palace <延禧攻略> is airing on TVB Jade with much fanfare and popularity, as viewers finally get to see another side of Charmaine Sheh (佘詩曼), HK-drama’s number one sister. In the Qing Dynasty drama, Charmaine plays a villainous royal concubine, a first in Charmaine’s 19-year television drama career. Story of Yanxi Palace takes during the reign of Qianlong (Nie Yuan 聶遠). 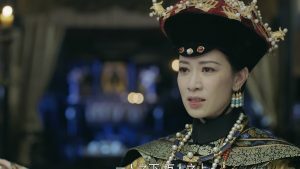 It centers on the maid-turned-imperial consort Wei Yingluo (Wu Jingyan 吳謹言) who enters the palace with the mission to avenge for her sister’s death. Although Charmaine plays only a supporting role, her character’s drastic change as the show’s main villain has become a hot topic. Consort Xian is originally just an unassuming court concubine who just wants to live her life, but after a series of changes in her family and her mother’s death, Consort Xian turns into a manipulative person who schemes her way up the royal hierarchy. It’s only been a week of broadcast in Hong Kong, but viewers are already getting chills down their spine seeing Charmaine onscreen. 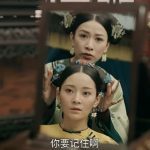 Consort Xian (Charmaine’s character) is aggressive yet gentle, and as she helps the two consorts (played by Tan Zhuo 譚卓 and Wang Yuanke 王媛可) ostensibly fix their hair, she confronts them in front of their mirror. These scenarios remind netizens of a similar scene in War and Beauty, when Charmaine used the same tactic on Gigi Lai’s (黎姿) character. I just started the Mandarin version on episode 13. This is one of the best performances I’ve seen from Charmaine ever. Better than any role that Charmaine has had at TVB in the past 10 years (at least). The plot is solid with plenty of twists and turns, moving at a nice pace. Everybody can act. The backdrop is very realistic. Most things are on point. A quality drama that tvb cannot produce these days. This is the most dynamic character I’ve ever seen Charmaine play (I’ve seen bits and pieces of future episodes as the gf is way ahead). @anon I also really want to point out this drama is really good. It has 0% in pursuing absolutely nothing else besides hoping to watch eye-candy actors, shipping couples to have cute scenes and so on….for example, like what we see with Fuyao or Sweet Ashes Like Frost. All the actors are really mature in acting even though they are not well known and probably even first time shooting big roles. They don’t rely on how good they look, it’s all about the story and the character. So, it made me get that impression that most of the actors are natural people, while actresses who try way too hard to look cute comes off very plastic.The whole plastic people thing bothers me very much, I’m glad there is finally a drama that made me feel so much less about that now. 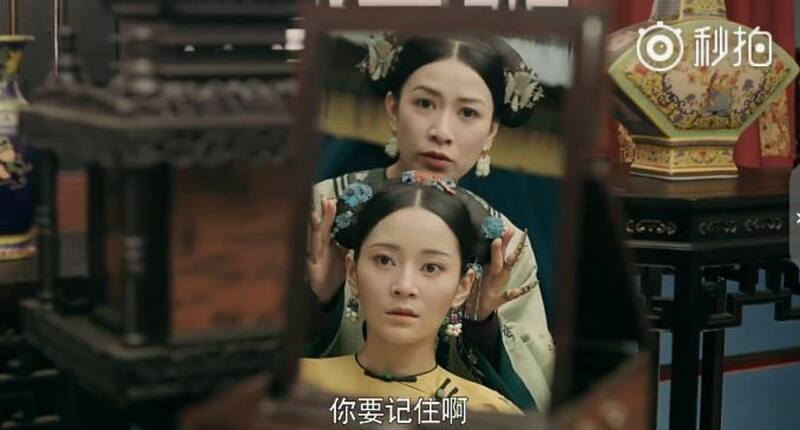 The “Story of Yanxi Palace” is a very good drama – much better than those historical/fantasy/romance mainland dramas that are coming out this year. Charmaine’s first villain role was in the “The Flying Fox of Snowy Mountain” (1999) TVB series with Sunny Chan. Both roles are quite similar in that the characters were both good-hearted at first, but then became evil. Aside from this series, I find that a lot of Hong Kong actors often play the villain roles. Maybe it’s to prevent bad image of their mainland artistes or from them being scolded/hated by netizens. Charmaine’s probably my favorite TVB actress, but I am not fond of her thin facial structure. I’m not sure if it has to do with age or weight loss, but I like when she used to have a little chubbiness in her face, like in the drama “Point of No Return” (2003). I agree, Charmaine has lost her baby cheeks for well over 10 years. I think it has more to do with weight loss than age as she thicker earlier in her career. I think you have mistaken “The Flying Fox of Snowy Mountain” with “Heaven Sword and Dragon Sabre”. Charmaine’s character in Flying Fox doesn’t have a mean born in her body. She was good from beginning to end. @peachyogurt Actually, Charmaine has filmed several Mainland drama before this and she is the lead or shared lead in all of them. For Yanxi, during the production Yu Zheng has told Charmaine and also fans in group chat that this drama have shared leads (Wu, Qinlan, Charmaine). He even said that in terms of screentime, if Wu have 15 scenes, Charmaine have 13 scenes in comparison. Of course after filming we all know he lied, he only promoted Wu and the actor that played Fu Heng in stills, trailers etc (he said of course, since both of them are signed under his agency). The funny part is, when the drama is about to release on iQiyi, Charmaine’s picture was used in preview, video thumbnails. Go figure. In Charmaine latest interview, she was asked how she felt being a supporting character and she replied it’s not a supporting role, and she enjoys portraying the character. @sehseh Very interesting. I was wondering why I never saw Charmaine often in the beginning of the drama. Thanks for sharing, didn’t know that! No need to feel sorry for Nie Yuan. He had been forgotten for years until this drama bought him back into the limelight. While reports of Uyghur oppression are escalating in the west, it’s ironic that Uyghur actresses/actors like Dilraba, Merxat, Gouli Nazha, Medina Memet are enjoying popularity in China. @kidd Yes you are right! Thanks for the correction. Market is too competitive. That’s the best the majority of HK stars can get – supporting. Agreed, I don’t think there’s a conspiracy against HK actors where they can’t get leading roles. Most of them simply aren’t as well-known as mainland actors, so they don’t get leading roles. The HK actors that are just as or more popular probably aren’t interested in starring in mainland dramas. In terms of acting ability, nearly all leading and second leads in China are at a very high level, so it’s highly competitive all-around. @llwy12 But if those highly paid stars choose to accept the lower pay, it would mean that those less popular ones will have to lower their pay even more in order to get offers. This isn’t her 1st villain role. Anyway her mom in the series played her character in HZGG? I do look forward to seeing Charmaine in this series, the only reason why I am watching. She is giving a somewhat competent performance at this early stage mainly because her biggest weakness is covered(her voice) and her greatest asset is magnified (her expressive eyes). I don’t however enjoy the way the leading character is written, so brazen, so brave, a wonder she’s still alive. I enjoy the empress’ story though and the various concubines. It’s the main character’s story that is a bit annoying right now. But nothing beats the moment the bad people get their comeuppance. Am sure Charmaine will have hers in the end. Historically her real counterpart did have a very sorry end. Point is winner is Qian Long and his ever evolving ever revolving many many wives. Still pissed with qian long in Succession War. In this series we see QIan Long trying to curb bribery and corruption, joke is much later he kept his most corrupted official. Never liked Qian Long. @funnlim ‘in 19 years’. I guess they are referring to HSDS 2000 being her last villain role (Zhou Zhi Ruo). The story is based on a novel, of course the main lead can’t die so easy! Hahaha. But yes, some of the servants in this drama talked so insolently to their masters, especially the lead actress… in history would have died many times over. Lives are cheap back in those days, especially servants. @funnlim I have the exact same thought when I watched this drama. I was wondering how is the lead actress still alive acting like that? Realistically, she wouldn’t be alive acting like that back in that time. It’s also funny how the consort who isn’t even afraid of the Empress was or almost shutdown by the lead actress every time they meet or there’s problem involved them. She also talked recklessly with a loud voice infront of the emperor. It doesn’t make sense at all. Her acting makes me feel like she’s someone who lives in 2018 rather than in those old time. I do think she can act, but they tried too hard to make her character brave and strong ( or in the wrong way). @littlefish yeah talking about charmaine. I haven’t checked but I think our heroine actually was the mother if jiaqing our hero in succession war. But she died young. @funnlim Uhm I might be wrong but I thought I read from wiki, and it seems our heroine is actually live long? As she become the untitle empress (as in she control the harem even though she’s not the empress) after Charmaine’s character lost favour? @littlefish at that time no. Empress so she was defacto empress. I suppose 40s and 50s are old enough. She died in 40s? 50s? But she was never made empress. I wonder why. I can already tell this drama has potential because it’s a mainland series, and they’re the best at producing ancient dramas. But why is the story about looking for sister so similar to the previous drama we just watched? Did they hire the same person to do the script or something… Honestly though I’m pretty far in the series and I’m already hooked with the story and acting (also love the dialogues and the smart banters between characters). My parents usually love to watch ancient dramas, but they refused to watch this because they think the main actress is ugly… actually a lot of people online are saying the same thing, but I just couldn’t help but root for her (she looks a lot like Anita Mui if you haven’t noticed). I did some research and notice she is supposed to portray Jiaqing’s mother. If you look closely at the ancient paintings, her facial features fit this actress perfectly. They really went all out to find actors/actress to play their respective roles, which I really like (ex. Qinglong with his sharp jawlines and skinny cheeks). I honestly don’t watch Asian dramas that much anymore, but Qinglong is my favorite emperor to watch. I might just binge watch and finish the Mandarin version and forget the Cantonese one. @vell Yea, there are alot of comments about the lead actress’s appearance. The only thing that annoys me is how they wrote her character. She wouldn’t be alive acting all strong, brave and talking recklessly and not being afraid of the royal family- concubines. @vell Uhm, no, I don’t think they went all out to find an actress that look like those painting to portray them. Yu Mama just got lucky. She’s from his studio, and he gave her beefy character in his last series, untouchable lover. By beefy I mean strong independent woman who knows how to manipulate to get her stuffs done disregard who she’s hurting, including her brother. This is laying the foundation for her next series. She looks older than her age I think, however makeup well, and she’s quite small. I don’t think she’s ugly, just a bit too bony. I agree with you. At least, she is not plastic. Or if she is, she doesn’t have a plastic feature that bothers me (to me it’s huge eye bags). For her character, she is an outstanding person, a 1 out of 1000 who is smart and unlike anybody else so it’s no wonder why she miraculously can do things other slaves cannot do. If she was nothing but a cutesy girl who is brainless and get saved, yeah that annoys me! But this girl is the ugly maid who doesn’t save herself only but can get her revenge at the same time of saving others! Her brain is huge. I don’t quite understand when many people complain about her wits, if there is somebody witty like that in real life would you dislike them because they are too unrealistic? lol…I like smart characters, and especially when the actress matches it well. @davy I find yingluo very scary. She’s too shred too smart and very lucky. I find her very very scary. No need to be scared of Yingluo unless you treated her unfairly. The scary ones are those devious and scheming concubines who pretend to be nice. @davy I love smart and manipulative lead heroine. I don’t hate this lead actress. I just find that some of her actions can get her kill in real life during that time. If you are too smart, you won’t be safe too. She is not the only smart person in the palace. For some scenes, I even questioned how come she still alive when she was so bold to do those things or have those actions. Of course, she is the heroine and they wrote her like that, so she won’t die. Also, I feel like the palace rules in this drama aren’t that strict. Didn’t watch it but heard a lot of good reviews about this series from my friends as well and I’m really glad. Hope this translates to higher earnings for iQiyi since I own their shares. LOL! I can honestly say I watched this for Charmaine. However, once I started, it wasn’t about her anymore. I quite like the drama and think everyone did their part adequately. Some people commented that the main lead Wei Yingluo is too ugly…I did think she looked a tad bit too alien. And her expression a bit pokerface & eery. But because her face is so distinctive and her acting convincing, I now find her attractive lol. But for Charmaine herself…how do I say this. I think she recycles her expressions too much. I don’t mean recycle in this drama, I mean I’ve seen her use the exact same expressions in her previous dramas. It’s not dynamic enough. If an actor uses the same mold of acting across all their roles, it starts to look boring, recycled and too unskilled. I’ve been following Charmaine through a lot of her career, and her skills look like they’re stuck. In comparison to her mainland counterparts, I feel like she holds up adequately, but unable to excel. @coralie I think lead actress did surgery to her face or at least face shape. Credit to charmaine she is aging elegantly. But acting wise still lacking. I didn’t plan on watching this because it’s a Yu Zheng production, plus Qing Dynasty era and aesthestics don’t appeal to me. However, I did get hooked because the story is addictive and surprisingly, Yu Zheng produced it without the usual tackiness of Manchu styles, although the men’s pigtail hairdos remains ugly. Seems like this drama is a huge surprise hit among Chinese audiences, redeeming YZ’s reputation. Most of the mainland audience have the same negative opinion about Yu; they were prepared for a diss-fest when tuning in to this drama, but were much surprised by the high quality of this drama. Yu has reflected on his past transgressions and many are giving him a chance for redemption. I’m not keen to watch Mainland chinese dramas previously because their series are mostly long and draggy…& i’m particularly not interested to watch their modern series at all. The only few Mainland dramas that i’ve watched so far are all ancient/palace dramas. The Story of Yanxi Palace is my fourth Mainland dramas thus far, which i think is fast paced with surprisingly captivating story (although many commented in other posts that Yu Zheng’s series are as worst as Wong Jing’s). Anyway, i’m watching the Cantonese version (so i’m only on episode 10), which is the TVB edited version with only 56 episodes in total…so perhaps the draggy scenes had been cut to shorten the series (which i appreciate). I’m not a fan of lengthy series…thus rarely watch Mainland dramas except for those highly acclaimed series (my last Mainland drama before watching Yanxi Palace is The Legend of Zhen Huan). As with most of the viewers, i watch Yanxi Palace initially because of Charmaine and because TVB hardly produce a good palace scheming drama in decade, but now it is the story/series itself that got me hooked and can’t wait to watch every single episode. I hope this series will continue to be exciting till the end, and don’t get me feeling disappointed wasting my time watching it (which is sadly how i feel about Deep in the Realm of Conscience). @diana80 Did you ever watch Nirvana in Fire? It received high praise from Asian and international fans. The edited HK Canto-version was a flop though. No, i didn’t watch Nirvana in Fire. I did plan to watch it after the show finished airing, but then i heard that there will be a sequel (NIF 2). Therefore, considering that both seasons will have more than 100 episodes in total…thus it stops my intention to watch it. Because i think that to get a complete story, of course i should watch both, but more than 100 episodes (NIF + NIF 2) are too much for me. Anyway, do u think i can just watch the original & drop the sequel? Does the sequel closely related to the original series? Which one is better…NIF or NIF 2? @diana80 The so called sequel has nothing to do with NIF the so called prequel. Each can be watched individually. NIF must be watched because it is quite simply excellent BUT do avoid TVB version. It is faster paced but the ending spoils the entire series. Thank you for your recommendation. I’ll give it a shot then. @diana80 You don’t have to watch NIF1 to understand NIF2, as it can stand solely on its own. The brief flashbacks to childhood scenes of the older characters and their memories of the Mei Chang Su character has spurred many to watch or rewatch NIF1. I read somewhere saying that the Cantonese version would include more Charmaine scenes that weren’t inside the mainland version, so you will get a more fleshed out character. Do you watch the Cantonese version online? If so, could you kindly share the link? Make sure you use an adblock extension. There are so many ads on these streaming sites. @polypeptide I am watching TVB version but mandarin dialogue. So far very little Charmaine, but when there is, her scenes goes on far too long. I’m on episode 42 (Mandarin version). You will not be disappointed! This is a gem. Wow…you are way ahead! I’m only on episode 10. I’m now thinking whether i should switch to watch the Mandarin version due to the many positive reviews for the show. Guess it may be different from the usual draggy Mainland series. @diana80 Yu Zheng is never draggy but his is often leaving feelings of head butting one self, this series no different for good reasons and for usual bad reasons. Yanxi palace isn’t excellent but it has elements where we all enjoy a good B-fight so to speak. @funnlim Uhm, YU Zheng does do draggy plot though. A lot of his series love to swift the focus to a different character, and leave the main couple in limbo in the middle of the series then rush the end. You watch his series and you would be when will we get back to the main storyline! More scenes with charmaine nOw and she is not doing good for me. Just feel inadequate.